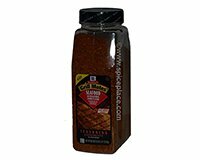 In March 2014 McCormick changed the name of Grill Mates Salmon Seasoning to McCormick Seafood Seasoning to express it's more general use. The seasoning inside the package is exactly the same. No need for the cedar planks when seasoning with McCormick Grill Mates Salmon Seasoning. There is also no need to order and store multiple flavor ingredients ... and ... No need to measure and mix ingredients. McCormick® Grill Mates® Salmon and Seafood Seasoning makes it easy for very flavorful, on-trend cooking. Shaken or spooned, Salmon Seasoning adds the big, bold flavor of lemon, garlic, spices and cedar smoke­- for just pennies per serving. McCormick Salmon and Seafood Seasoning also adds a Great Smoky Cedar Flavor to Recipes Beyond Just Salmon! Great on fish, beef, poultry and pork. Shake on grilled zucchini, asparagus and broccoli for fantastic flavor. Delicious when added to your favorite hamburger recipes. Toss with popcorn for an exciting new snack adventure. Coat large roasts of beef for delicious smoky cedar flavor. Use in place of salt for unique cedar flavor. Ingredients: Salt, Spices (Including Chili Pepper and Red pepper), Sugar, Onion, Garlic, Citric Acid, Red Bell Pepper, Tomato Powder, Sunflower Oil, Maltodextrin, Disodium Inosiate and Disodium Guanylate (Flavor Enhancers), Lemon Peel, Celery, Turmeric, Ascorbic Acid, Natural Flavors, and Natural Cedar Smoke Flavor. Grill Mates® is a registered trademark of McCormick and Company, Hunt Valley, MD USA 21031.